Music was such a vital part of what enabled me to really feel a connection to the new culture which I was slowly adapting to in Colombia. Artists such as Fonseca, Carlos Vives, Chocquibtown, and Bomb Estereo became on constant repeat in my apartment and were an easy way for me to have something in common with the new friends I was making. For me, music and literature are two of the most beautiful art forms that exist as a way for humans to express emotions. It was because of this that I was so interested in taking the ETEC 540 course that explored the changing spaces of reading and writing. ETEC 540: Text Technologies – The Changing Spaces of Reading and Writing was one of my favourites in the MET because like the music in Colombia, I felt that I was able to share my love of reading and writing with my classmates in this course and we really embraced our new technological culture more easily because of it. I worked with a group to create a digital choose your own adventure narrative which is available at: http://etec540cyoa.weebly.com/. This was a real eye-opening experience for me because we were exploring how reading and writing is changing because of new digital technologies, and yet, we still created a text-type that was something we all fondly remembered from our childhood. We had assimilated the new landscape and managed to find a way to make it familiar for us all. We reflected on this process further in our Artists´Statement. 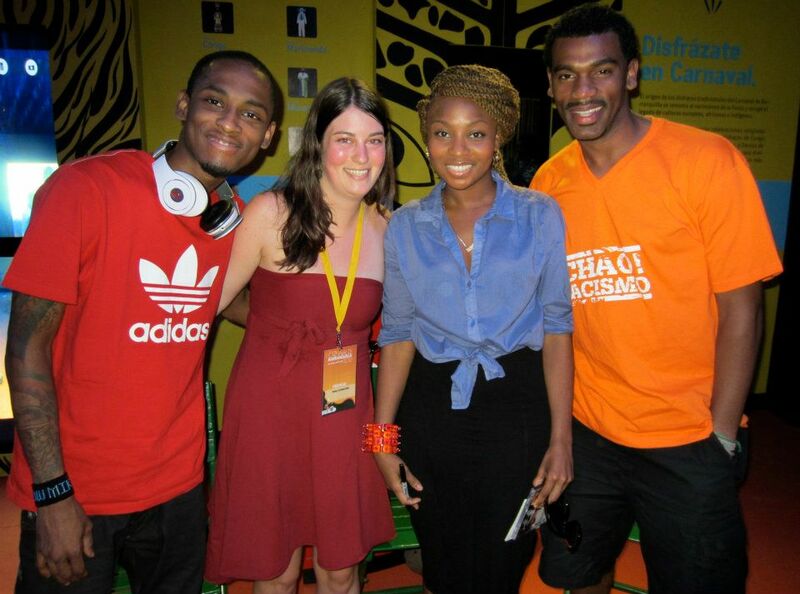 Here I am with Chocquibtown, a very popular group from the Pacific coast of Colombia. I also took an outstanding Summer Institute on Recurring Questions of Technology (LLED 481) in which a group of educators in all different stages of our careers and from different backgrounds came together to share our knowledge with each other, and, of course, to learn from leaders in different fields related to education and technology. More information on the different sessions for each day can be found on this wiki. One of the things that I enjoyed most about this course was the fact that it was one of those courses where I felt like I was in the flow. The new culture of an online learning environment was not always my favourite, so for me the opportunity to meet classmates in person and have that physical connect was really helpful and has a similar effect on me as music and literature do. I felt that I was in ¨the zone¨. Also, one of the areas we got to explore was intellectual property, which has always been something I have been interested in (I previously wanted to be an entertainment lawyer), so getting to explore that side of the law and its importance for teachers was really exciting for me. As part of this course, I decided to create a Guide to Intellectual Property for Educators and I created it under a Creative Commons license so it can be shared freely as an educational resource. Finding a way to improve education through technology is an art form, and even more challenging is finding ways to then make money off that technology. This was explored in the ETEC 522: Venture in Learning Technology course (learn more about this course in the food section). In a group assignment to create an Open Educational Resource (OER), we worked together to explore the possibilities offered by Learning Analytics (links to my group´s OER for the course). As we were introduced to these many possibilities we were then left to figure out the balance between these possibilities and how they could be monetized. The economics of educational technology (links to a MET project I did on this topic) can be a difficult subject to discuss. ETEC 522 gave a well-balanced overview of the topic and I had the opportunity to pitch a product that I think would be of great educational value for individuals experiencing culture shock. Please explore my LanguageBuddy App Venture Pitch to learn more.